Research and Statistical Analyst – Housing @ London, England, U.K.
Who is talking about the French Open? There are a number of on line efforts to register victims of shootings online. Shootingtracker tries to register all mass shootings, those with four or more victims. Slate had the gun death tally (GDT), gun deaths starting at Newtown, running through to December 31, 2013. This project is continued in the Gun Violence Archive. In this post I am comparing the 2013 data of shootingtracker and GDT with CDC data of 2009 to 2011. Compared to each other shootingtracker and GDT are similar, but the CDC data has much higher counts. Shootingtracker has data of shootings with four or more victims. Since not everybody who is shot is dead, this makes the data uncomparable to CDC data. However, by restricting the selection to those shootings with four or more killed, it is still possible to make a comparison with GDT data. However the GDT data is not organized by incidence, but rather by victim. Its also appears that the state given is not the state of the incident, but rather the residence of the victim. In addition, the dates used in GDT and shootingtracker are not the same. Since both GDT and shootingtracker have web links for each record, it is possible to manually compare them. After this check there were 53 incidences, 49 from shootingtracker, 46 from GDT, 42 in common. Based on these data, using capture-recapture formula, approximately 54 incidences are estimated. 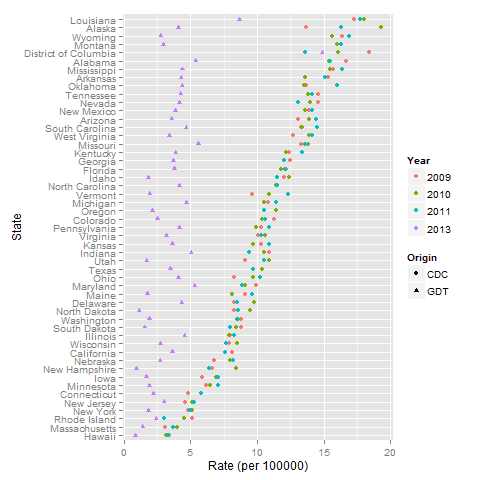 Data from GDT are summarized by state and divided by inhabitants to obtain a rate. The plot shows huge differences. While the years covered are different, the year to year variation in the CDC data seems much less than the difference with GDT. Washington DC, which seemed so bad in shootingtracker is bad in all data bases. However, it does not stick out as much, it just appears that things are more easily registered there. To leave a comment for the author, please follow the link and comment on their blog: Wiekvoet.